On my first road trip out West back in college, the Black Hills was my first stop. The original goal was to watch the fireworks at Mt. Rushmore on the 4th of July. Fortunately, we were rained out. We ended up spending the next day touring the Black Hills and then seeing the fireworks that night. That one day left a huge mark on me. Bonnie and I spent a week here in the summer of 2012 exploring the area and absolutely loved it. I have been hankering to come back to the Black Hills ever since we started Our Wander-Filled Life. 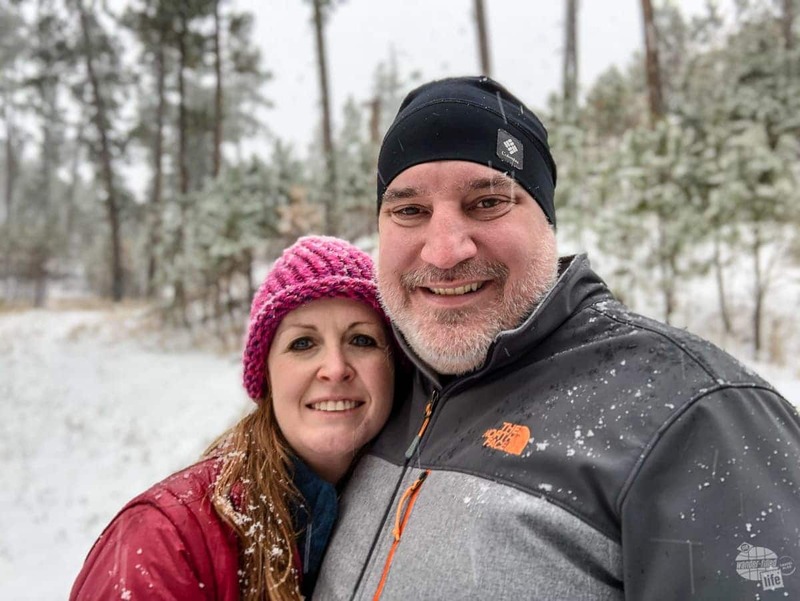 Fast forward 6 years and I have returned to the Black Hills for the second time with Bonnie but this time in the winter. We were looking for a place with lots to do in spite of the government shutdown (which made our original New Mexico trip pointless) and the Black Hills did not disappoint. 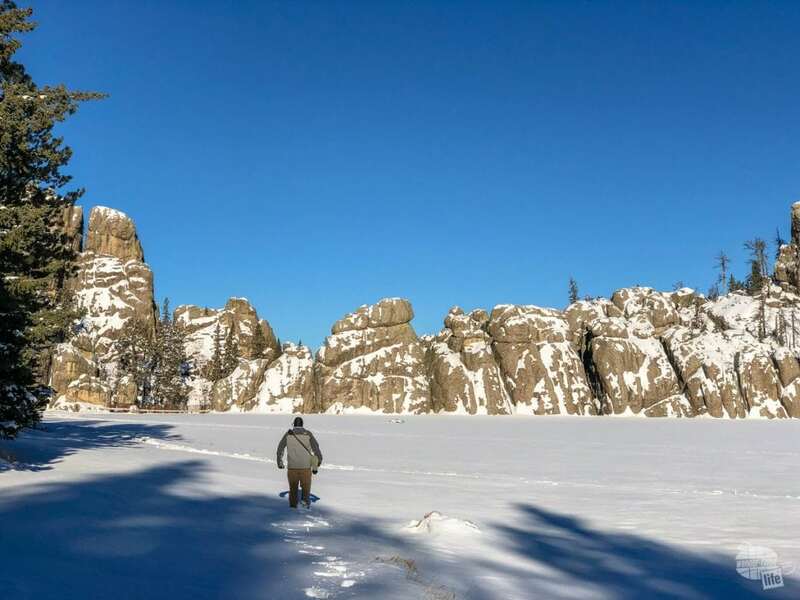 In fact, like many places out west, the Black Hills in the winter offers a different experience than in the summer. And, despite the cold, we absolutely loved the experience! 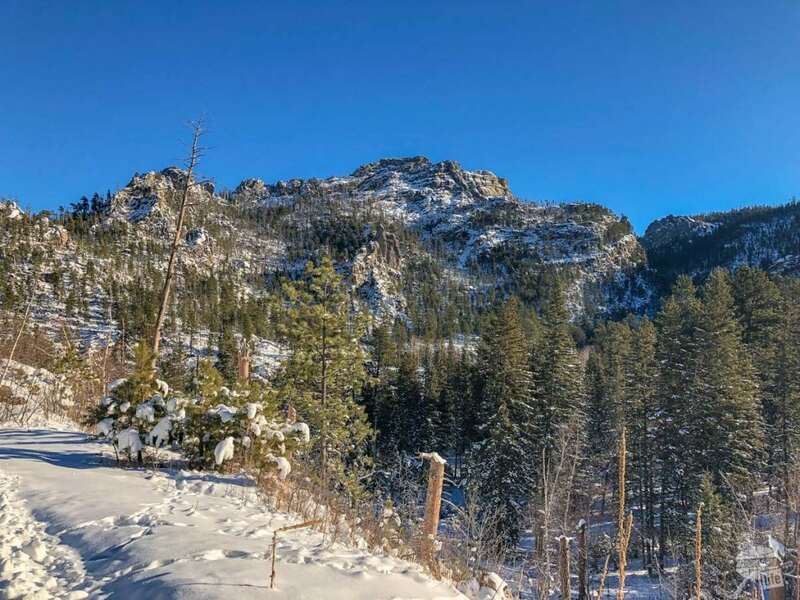 Why Go to the Black Hills in the Winter? The tourism season in the Black Hills typically dies down in the fall and does not pick back up until May. As a result, many businesses and attractions close until the spring. That said, there is still a ton to do and see. 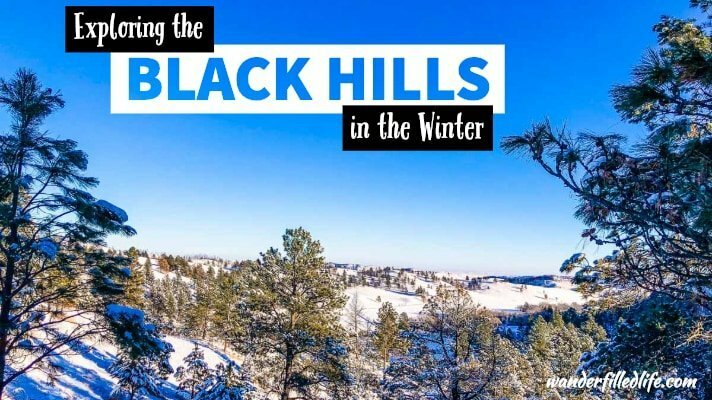 If you want to avoid the crowds, and can handle the cold, the winter is a perfect time to visit the Black Hills. 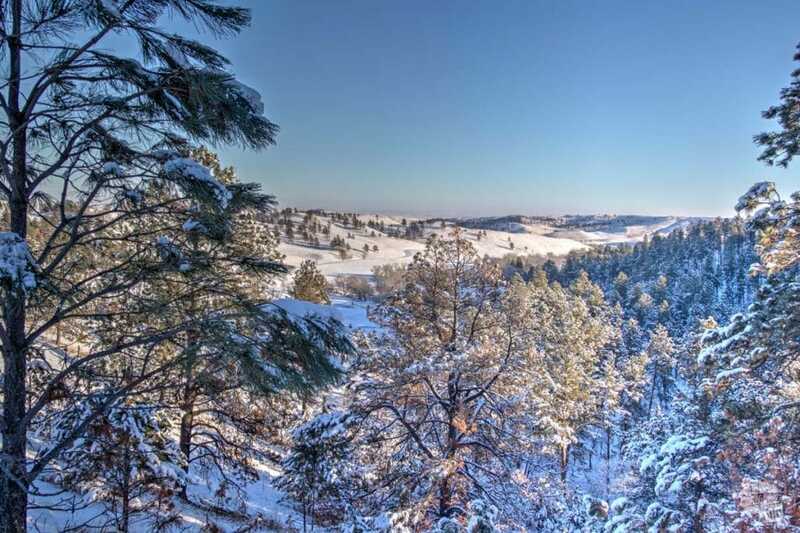 Winter snow turns the Black Hills into a wonderland. If winter sports and snowmobiling are your thing, there’s a lot up near Deadwood. A South Dakota DOT plow. We were very impressed with how well they kept up with plowing in South Dakota. 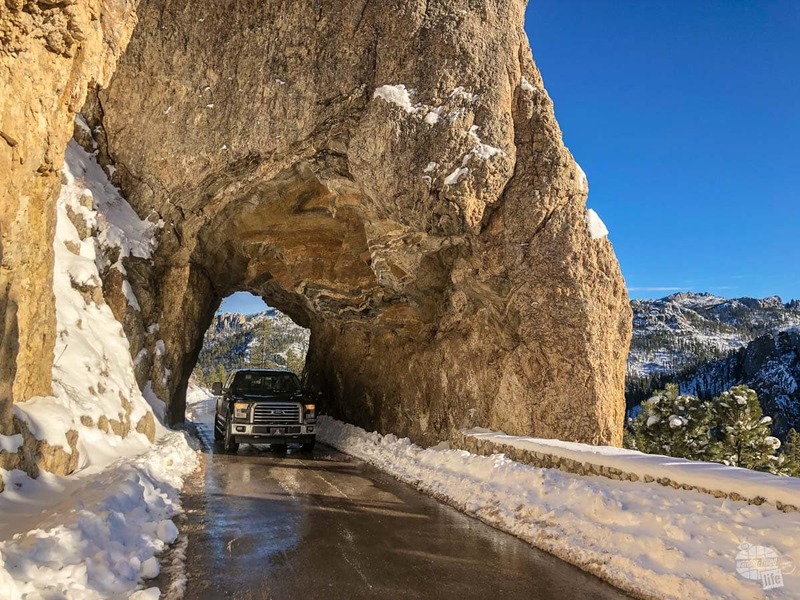 Getting out and seeing the sights requires some winter driving. The South Dakota Department of Transportation really impressed us with how well it kept up with the roads. Snow came in hard and fast overnight on December 30. 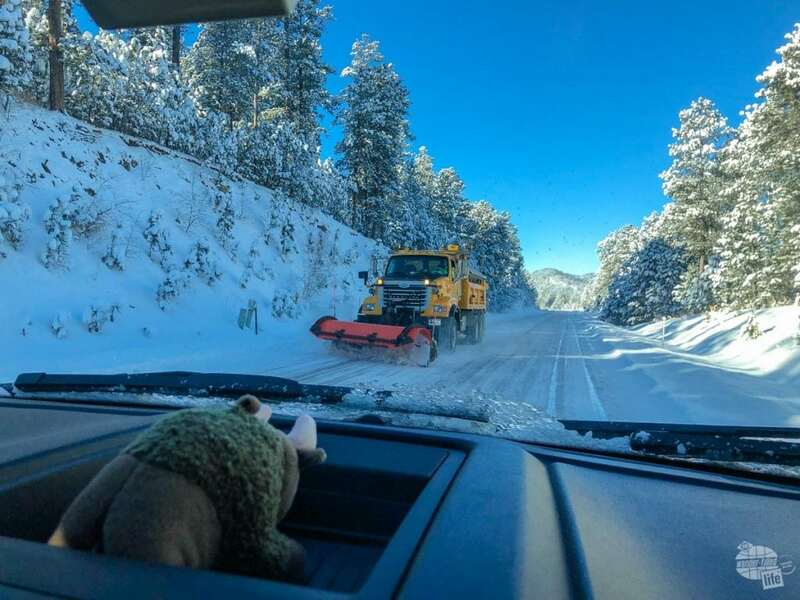 By January 1, all the roads we drove on were plowed and treated. Indeed, driving into Wyoming on January 3 was a whole different experience. The roads were so much better in South Dakota. 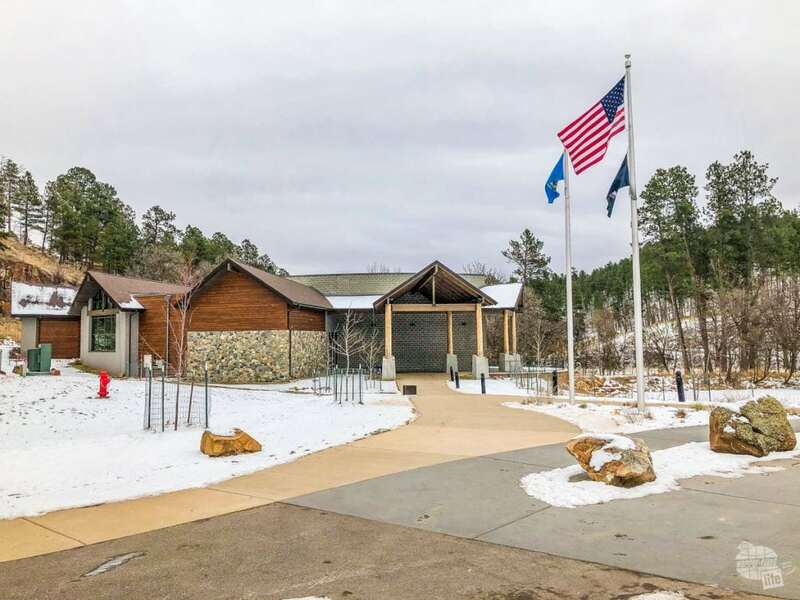 There is a lot to love at Custer State Park. The rather large state park is located in the southern part of the Black Hills. It is home to all sorts of animals, tremendous views and glorious hikes. Start your visit at the Visitor Center on the northeast corner of the park and then work your way out on the Wildlife Loop. Allow at least an hour to drive the loop and be on the lookout for some of the park’s more famous residents: the bison and the begging burros! 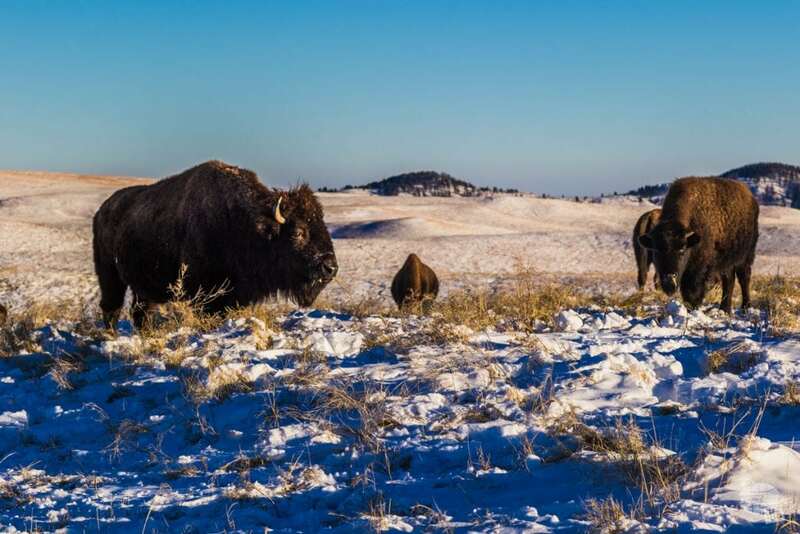 Custer State Park is home to a herd of more than 1,000 bison. We found them on the south end of the park one day and out on the Fisherman Flats Road a couple days later. The bison along the road enjoyed licking the road salt off of the truck, which made for an interesting experience, to say the least. We have never had a bison that close to us before, even after multiple trips to Yellowstone National Park! Read more about finding and photographing wildlife in Yellowstone National Park here. 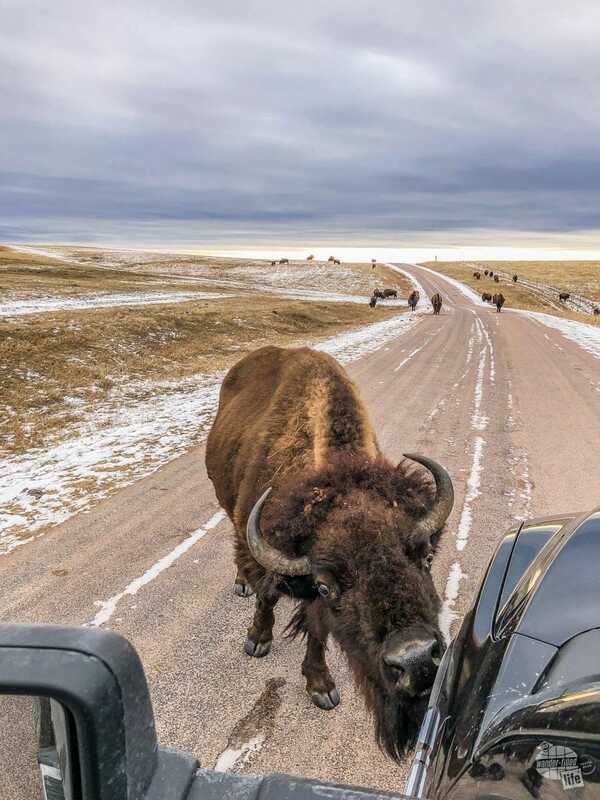 Despite their relative calm around the truck, one thing to bear in mind is bison are erratic and can become aggressive quickly. Do not approach them. After we moved through the herd, I did make a point to get out and take some pictures. I also kept my distance and did not make sudden movements. Bison cleaning the salt off the truck. The burros, on the other hand, while interested in the salt, are far more interested in food. They are well known for begging for food from drivers along the Wildlife Loop. We also found quite a few pronghorn antelope hanging around on the south end of the loop. While we did not see any this time, we have seen big horn sheep and mountain goats in Custer State Park. There are also elk, coyotes and mountain lions but we have not seen them yet. 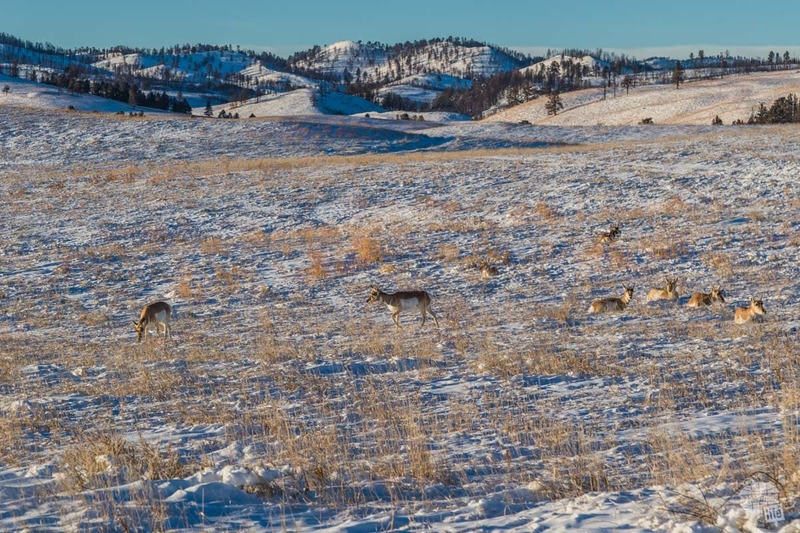 While the wildlife is the big attraction on the loop, be sure to stop and check out the scenery, too. There are some breathtaking views along the loop. As you come around the west side of the park, head west towards Custer and then turn up highway 89 towards Sylvan Lake. In the summer, I would say take the Needles Scenic Highway but it is closed in the winter. Sylvan Lake is the crown jewel of Custer State Park. In the summer, this glistening mirror is home to campers, hikers and swimmers alike. In the winter, with the nearby lodge closed, the area is home to solitude and surreal beauty. Grant hiking in the snow at Sylvan Lake. 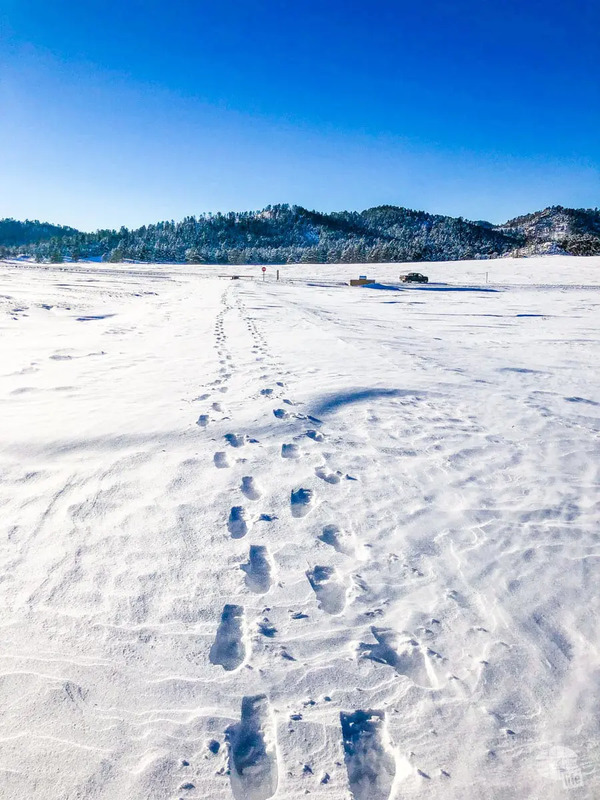 While we saw other tracks in the snow from someone who got up there earlier than us, we were alone while wandering around the lake. It was so quiet, so peaceful, so lovely. 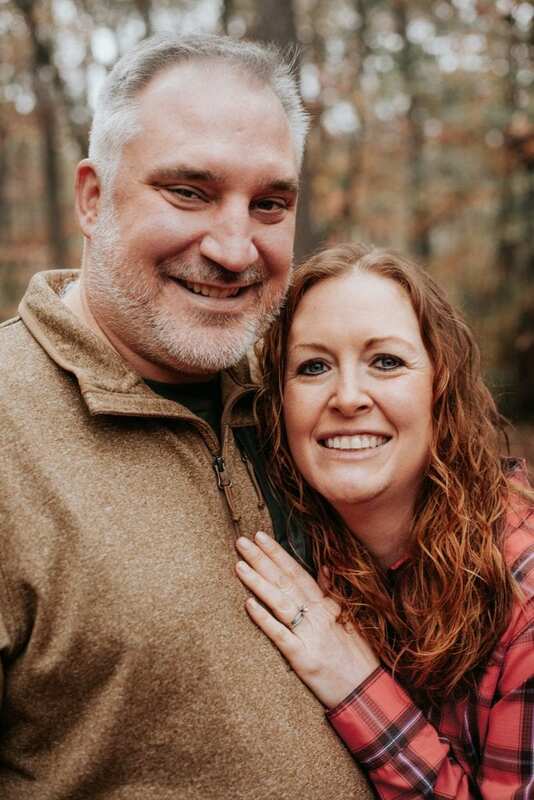 If you are hungry, you can head into to Custer for a bite. Otherwise, depending on road conditions, I suggest heading down Hwy. 87 for some fantastic views OR, i it is open, head back into the park to the northeast entrance and take US 16A, aka the Iron Mountain Road. Driving through the single lane tunnel in the Black Hills. The Iron Mountain Road takes you through a long series of switchbacks, narrow tunnels and Curley-Q bridges which offer one of the best views of Mt. Rushmore out there. Unfortunately for us, the heavy snow hit just as we were heading up the road making it a bit treacherous. Pro tip: Discretion is always the better part of valor when driving mountain roads in the winter. While four-wheel drive will handle a lot, it will not guarantee anything. 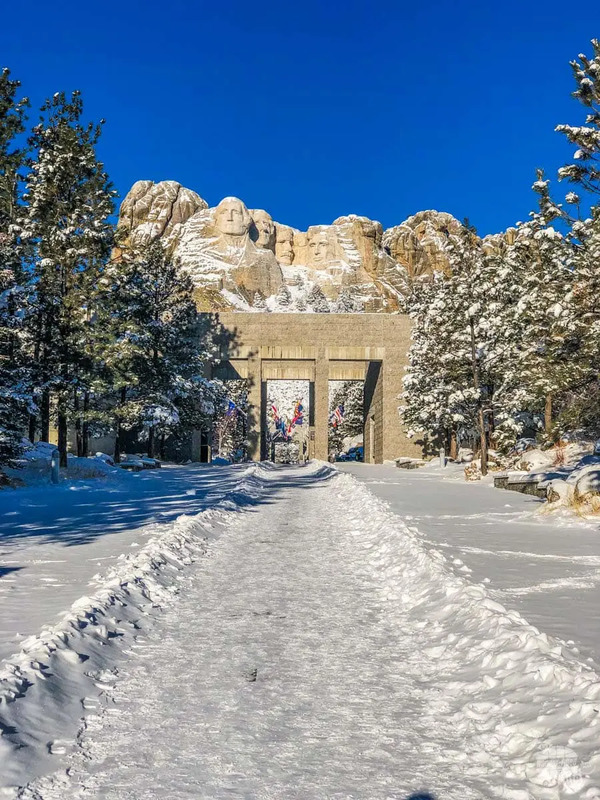 Despite the government shutdown, Mount Rushmore NM remained open thanks to Xanterra, the concessionaire which operates the parking area, etc. Despite several of the facilities being closed, we were able to see the monument and get some great pictures. The Visitor Center and Sculptor’s Studio offer a lot of information and back story on the carving and should not be missed. We have been to the memorial in the summer, so we were ok missing that due to the shutdown. In normal circumstances, both should be open. Not far from Mount Rushmore is the Crazy Horse Memorial. The Crazy Horse Memorial remains a work in progress as the carving slowly takes shape. Chief Henry Standing Bear of the Oglala Lakota asked sculptor Korczak Ziolkowski to create a sculpture recognizing the great chief, Crazy Horse, so that all would know the tribes had great heroes as well. This became a work of love for Ziolkowski and his family, who continue the work on the sculpture and develop an entire cultural center surrounding the area. You can easily spend a couple of hours here touring all of the exhibits on the life of the Lakota and the history of the memorial. 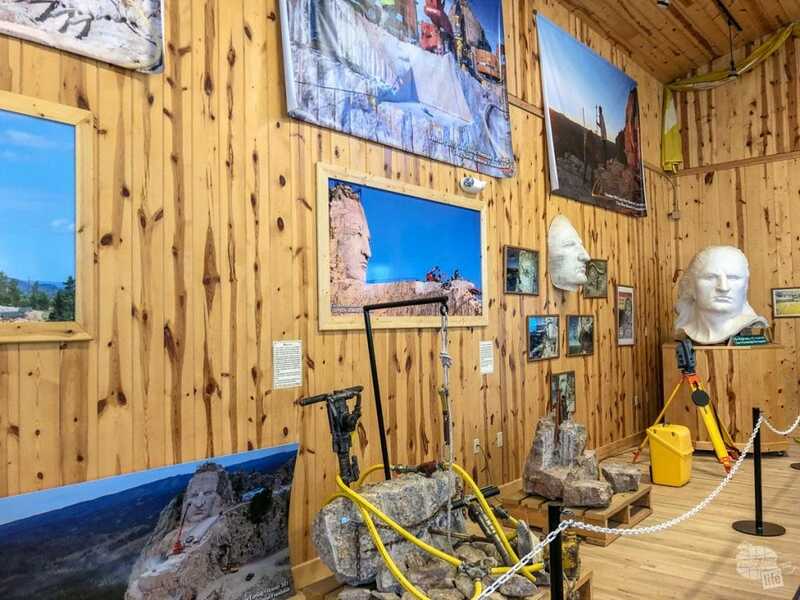 An exhibit at the Crazy Horse Memorial on the tools used to sculpt the rock. If you have never been out West and learned about the lives of the Plains Indians, this is a great opportunity. The Black Hills were sacred to several tribes and understanding why this memorial is being built is important in understanding the nature of the the area. South of Custer is Wind Cave NP, one of our favorite parks in the country. While the cave is the draw for most visitors, there is plenty of gorgeous scenery above ground, not to mention good hikes and bison! Indeed, one of the best hikes we have ever taken was in Wind Cave. Read about it here. That said, Wind Cave and Jewel Cave both offer cave tours throughout the year. While there is plenty to love about getting out in snow and cold, sometimes you just want to do something warm(er). Indeed, the caves are not exactly warm, but 49-52 degrees is better than the 12 degrees it was when we were driving around. Both caves were closed to visitors during the shutdown, but we had previously visited both back in 2012 so we were not too bummed. Still, Wind Cave NP was open for us to drive through and hike. 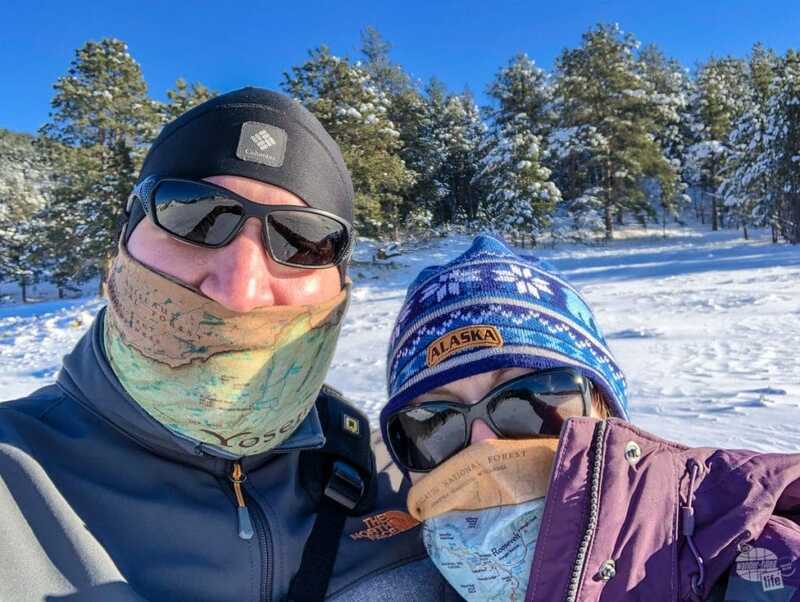 To be honest, we wanted to hike more than we did in the snow… We had good clothes, but no snowshoes and boy was it tough hiking in two-foot deep snow. That’s ok… It was completely gorgeous and we loved driving through the park. 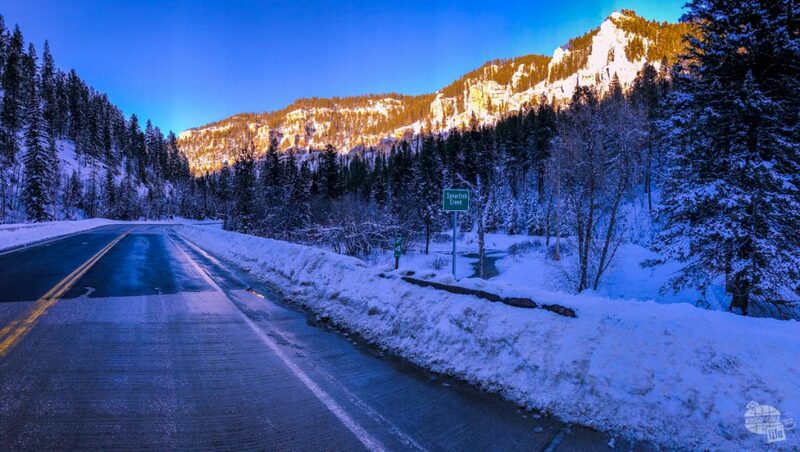 One of our favorite drives in the Black Hills is the Spearfish Canyon Scenic Byway. 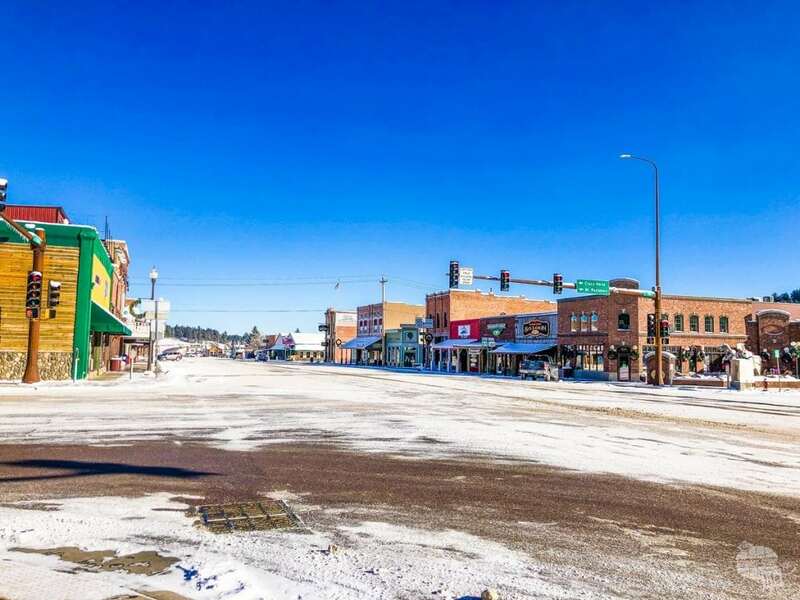 This drive takes you through one of the prettiest sections of the Black Hills. 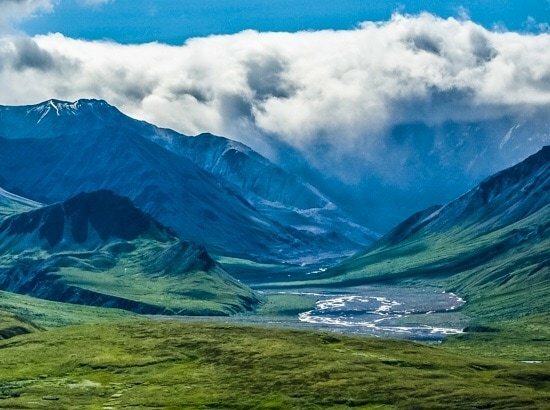 Plan on spending 30 minutes to an hour driving through, admiring the gorgeous terrain. Most of the attractions along the drive will be closed in the winter, but it does not negate the beauty of the drive. Relatively nearby is the (in)famous town of Deadwood, which has plenty of casinos and hotels, etc. open year-round as well as the Terry Peak Ski Area. 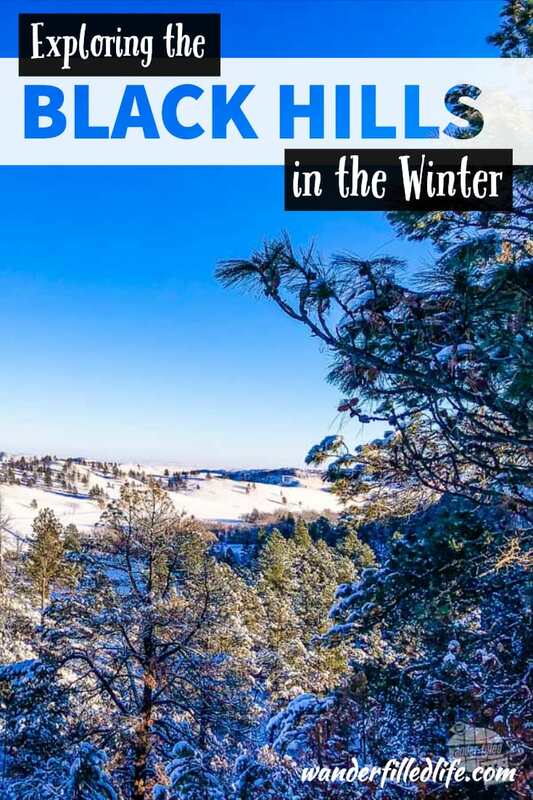 There are also plenty of winter sports opportunities in the Black Hills National Forest nearby. While not exactly close, Devil’s Tower NM is a couple hours west of the Black Hills in Wyoming and is more than worth the stop. This unique spire is know as the Bear’s Lodge or Bear’s Tipi and is the source of quite a few origin myths among the local tribes. I actually teach these myths as part of my American Literature course. 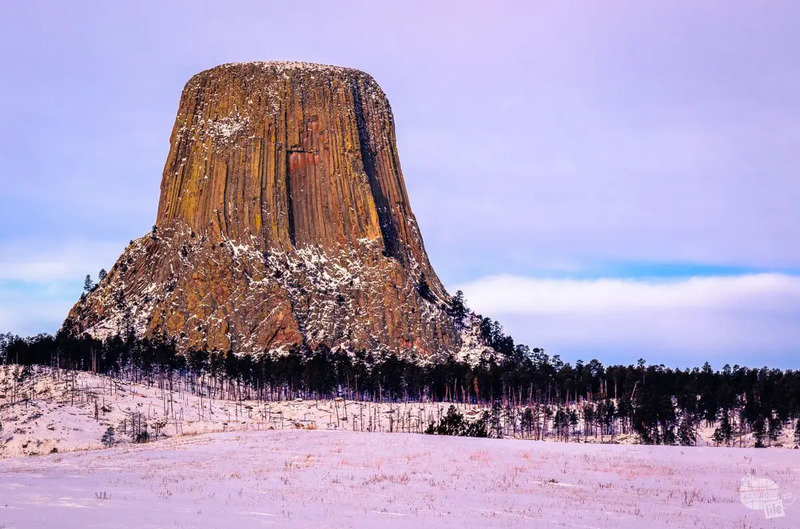 Besides seeing the tower and the visitor center, there is not a ton to do at Devil’s Tower but it is more than worth the drive. Just be careful of the roads if there has been a lot of snow. As I said earlier, we were not impressed with how well the Wyoming Department of Transportation kept up with the roads. Carhenge is quite a bit further, located in Alliance, NE, about 2.5 hours from either Custer or Rapid City. Carhenge is a free roadside attraction that Jim Reinders created back in 1987. 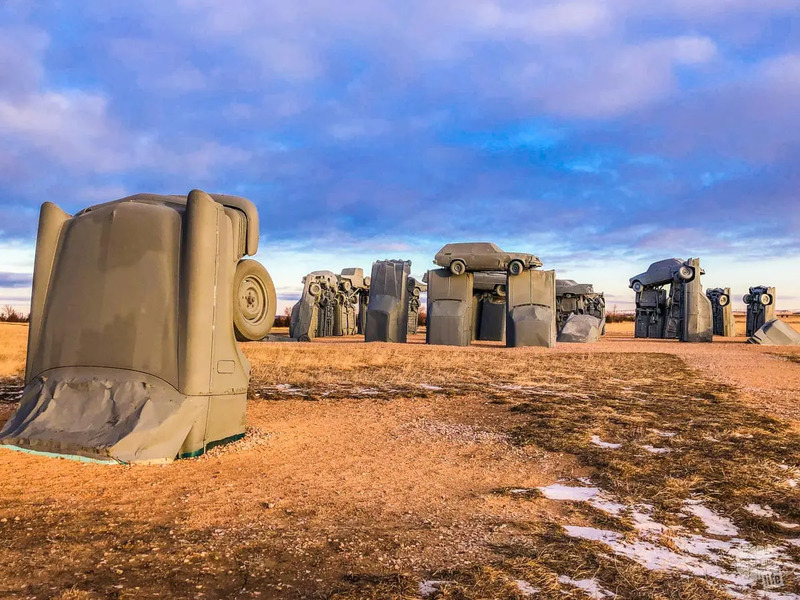 It replicates Stonehenge in England, but with cars painted gray instead. 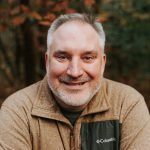 The site is pretty cool but is not worth more than about 30 minutes of your time. It is best visited on the way to or from the Black Hills. Still, it was interesting, unique and worth the stop if you are headed that way. Since we spent so much time near Custer State Park, we ended up eating lunch a couple of times in the town of Custer. On New Year’s Day, we found Pizza Works open and serving lunch. We got a medium pizza which was tasty and very filling for the two of us. The next day, we met our friends Nature Tech Family for lunch in Custer at the Buglin’ Bull Restaurant and Sports Bar. 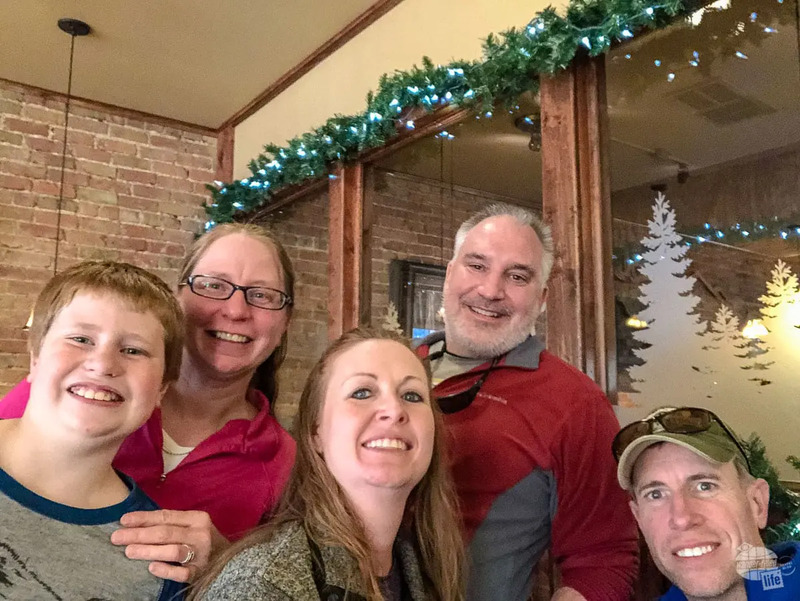 It was great to meet Kari and Tom along with their two wonderful boys and the Buglin’ Bull provided a great atmosphere for good conversation, not to mention we got to have a bison (Bonnie) and an elk (me) burger to keep us going for more exploring in the Black Hills. We would easily go back to both restaurants again. We got to meet up with our friends, Nature Tech Family, in Custer. 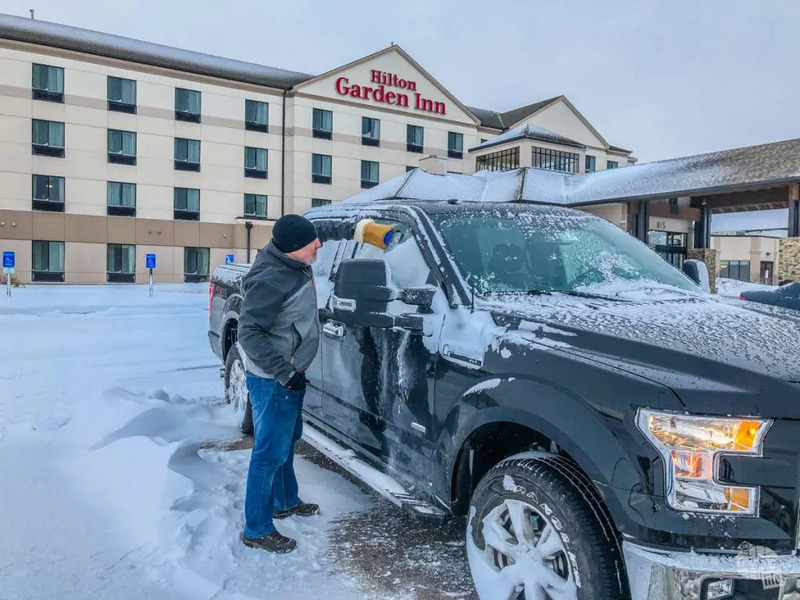 We stayed up in Rapid City at the Hilton Garden Inn, where we were able to get a good deal, point-wise and the hotel was great. Grant scraping the ice and snow off the truck. There are also relatively cheap Hilton properties in Deadwood (at least in the winter). We decided on Rapid City so we would have time to explore the town. While the government shutdown really threw a wrench in our original plans, we are so glad we came to the Black Hills in the winter. The Black Hills offer a ton to do and love even in the off season when there are a lot of places closed. Custer SP alone can keep someone busy for days and there is so much more to see and do. 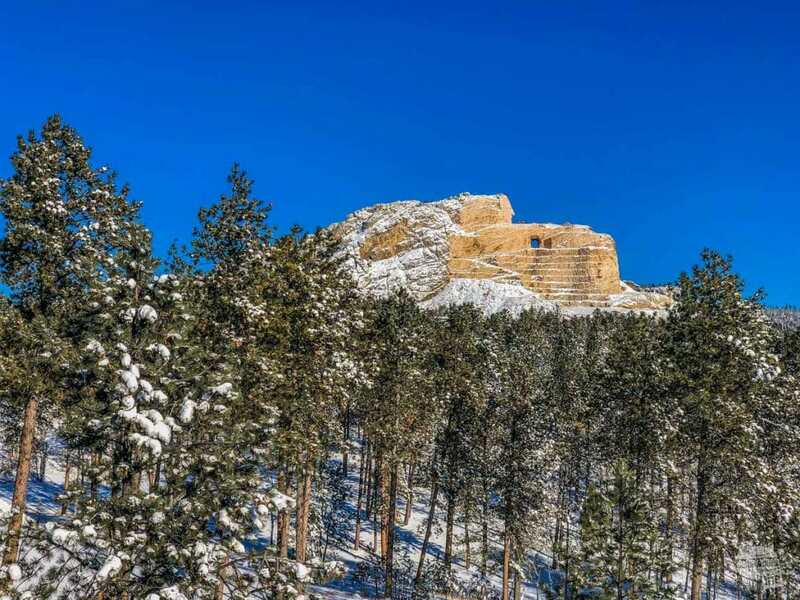 We loved seeing the area covered in snow and are really looking forward to returning again in the fall for Buffalo Round Up at Custer SP.